In this new film you travel with a fleet of customized vehicles designed to withstand gale force winds and are armed with the most advanced weather measurement instruments ever created. Join STORM CHASERS star Sean Casey and the researchers of VORTEX 2, the most ambitious effort ever made to understand the origins and evolution of tornadoes. The crew is armed with a 70mm camera, a fleet of customized vehicles designed to withstand gale force winds, torrential rains and hail. They're packing an arsenal of the most advanced weather measurement instruments ever created. 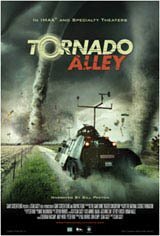 The stars of TORNADO ALLEY will take you on a thrilling quest to experience a tornado's destructive power at point blank range and experience the adrenaline rush and the science of nature’s most dramatic phenomena! Traversing the "severe weather capital of the world," TORNADO ALLEY documents two unprecedented missions seeking to encounter one of Earth's most awe-inspiring eventsthe birth of a tornado. Working with Casey, a team of scientists, the VORTEX2 researchers, literally surround tornadoes and the supercell storms that form them, gathering the most comprehensive severe weather data ever collected.